A pagination is used to split long lists or tables in smaller sets. List and table lengths should always be adjusted to their use cases. 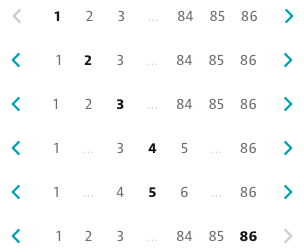 Avoid unnecessary pagination whenever possible. The pagination component should be used when space is limited and not flexible. For example if the selection in a table affects content underneath. The pager needs to display the first and the last page all the time. The arrow on the right of the pagination navigates to the next page, the arrow on the left to the previous page. Up to seven pages can be represented directly with the page numbers. If there are more than seven pages, the remaining pages are hidden behind three dots. These dots are not clickable. Another variant of the paging behavior - loading more items if not everything is visible initially - is the show more component. To use the Dynatrace pagination component, use the <dt-pagination> element. @Input() maxPages number undefined This specifies the maximum page number displayed. @Input() currentPage number 1 This indicates the currently selected page number. The default value, if not specified, is 1. @Output() changed EventEmitter<number> - The event which is fired when the user changes the page. This can be either done by using one of the arrows or by clicking on a page number. The number passed by this event is the new page which should get displayed.